Do you owe more than your home is worth? Are you behind on your mortgage payment or is it about to adjust? Are you tired of making payments on a home that may never be worth what you paid for it? Have you been turned down for one of those ridiculous loan modification programs? Do you want to short sale your home without worrying about your lender coming after you for a deficiency judgment? If you're considering a short sale, then this website will help explain your options and answer your questions about the short sale process. You DO NOT need to be poor or broke to qualify for a short sale. Banks approve short sales when they believe a hardship situation exists; however, hardship is not solely determined by how much a person earns. A hardship exists when there is a decrease in income or an increase in expenses. A strong hardship exists when you have both. You DO NOT have to pay anyone to do a short sale. A real estate agent experienced with the short sale process can obtain a full waiver of deficiency from your lender. How do you choose the right person to short sell your home? Should you hire a “friend of a friend” or the company with the most billboards around town or most commercials on the radio or TV? Wouldn't it make more sense to choose the real estate team who has successfully closed the most short sale transactions in Las Vegas? 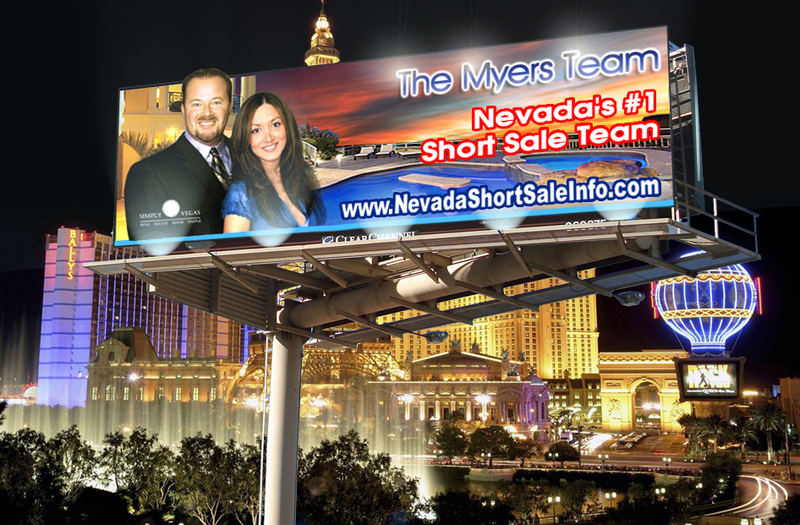 Since 2007, The Myers Team has successfully closed more short sale transactions and negotiated more short sale approvals than any non-lawyer affiliated agent or Broker in Nevada. * Our resources include a team of experienced short sale processors in addition to direct access to Nevada licensed attorneys. This allows us to stay up to date on the laws affecting short sales and the rapidly changing guidelines and procedures of banks and their investors. Our preferred escrow and title partners have extensive expertise in processing and closing short sale transactions not only in Nevada, but nationwide. This allows us to leverage their relationships with the major banks to get our files processed in the fastest possible time frame and escalated when necessary. Do I Need A Las Vegas Short Sale Attorney? Not long ago, billboards started popping up all over the Vegas Valley from attorneys offering short sale services. Many of us have friends or family who hired a lawyer to do their short sale; however, after spending thousands of dollars, they didn’t get the results they were looking for. There is NO NEED to pay anyone to short sale your home and this includes attorneys. Hiring an attorney does NOT guarantee a better outcome. In fact, the ONLY guarantee is that you will pay thousands of dollars for something a licensed real estate professional can do for free. Attorneys typically charge a hefty upfront fee; in addition to a monthly servicing fee. Essentially, they get paid regardless if your short sale is approved or not. In most cases, your money will NOT be refunded if they fail to perform. In contrast, when you hire an experienced real estate agent, they get paid by the bank once the deal is closed. Therefore, agents are highly motivated to get your short sale approved. If you hire an attorney who charges a monthly servicing fee, the longer they take to get your short sale approved, the more money they can make. Before you hand over your hard earned dollars to a Nevada Short Sale Attorney, consider the following; will the attorney guarantee their services and pay you a full refund if they fail to get your short sale approved or deficiency waived? If you meet with an attorney who doesn’t agree to refund your money, GET UP AND LEAVE! While there are many ethical attorneys out there, you should educate yourself before putting your faith in someone who stands to make a handsome profit from your bad situation. 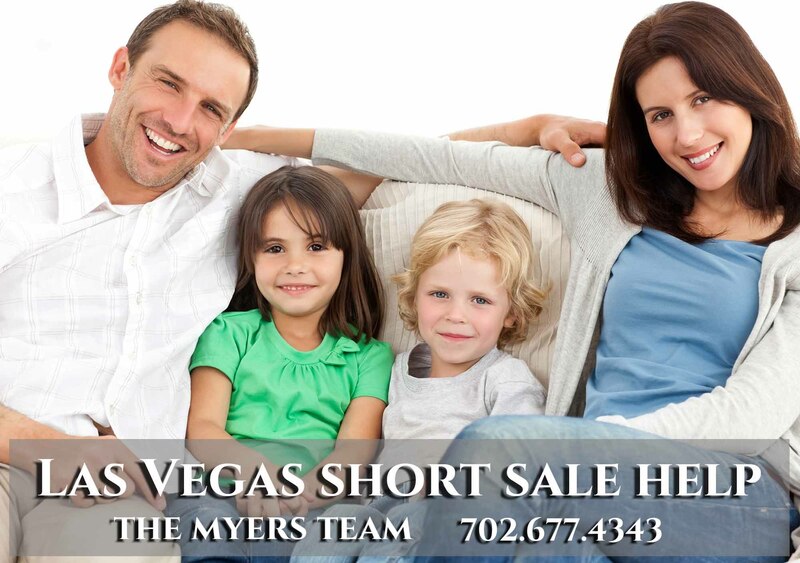 The Myers Team are the most experienced short sale agents in the city. * They are licensed by the state of Nevada to do short sales. Their short sale services are FREE and there are no upfront fees. They get paid by the bank. The Myers Team are authorized short sale agents with all the major banks (Chase, Wells Fargo, Bank of America, Nationstar, Ocwen, etc.) Why pay for an expensive attorney when you can be backed by the experience, knowledge and negotiating power of Las Vegas Top Short Sale Agents? Should I Go Bankrupt Or Just Walk Away? When the Las Vegas housing market crashed, many homeowners filed for bankruptcy thinking it would be a better option than doing a short sale, or “walking away.” Today, many of these people are discovering they still legally own the property. Additionally, bank(s) continue to post late payments on their credit report each month, long after the bankruptcy has been finalized. How is this possible? Attorneys will argue that after a Chapter 7 bankruptcy, you are no longer obligated to repay the mortgage debt. This may be true; however, it’s not quite that simple. Until the house is sold, your name will remain on title. As long as your name appears on title, banks can continue to post late payments on your credit report for years. You cannot begin rebuilding your credit until the house is sold and the deed is transferred. After a bankruptcy is finalized, banks are in no hurry and under no obligation to initiate the foreclosure process on your home. Some banks will let a house sit empty for years, hoping the home will appreciate, in order to receive a higher value at a future auction. There are other cases where banks cannot find the paperwork or verify the chain of title. Whatever the case may be, if your bank chooses not to foreclose, you may find yourself the holder of a “Zombie title.” A regular title can become a Zombie title when homeowners find themselves being mindlessly pursued by mortgage servicers, homeowners associations, local governments and debt collectors for bills related to a home they thought they no longer owned. This doesn’t just happen to people who file for bankruptcy or do a "Deed in Lieu." This can happen to anyone who “walks away” from their home with the intent of letting it foreclose. Not only can this destroy your credit, it can cause additional nightmares as well. For example, in a Zombie title scenario, you may actually be sued if someone gets injured on your property, even if you haven’t lived there for years. As the owner of record, there is a legal argument that you are responsible for maintaining and securing the property, in a reasonable manner, to reduce the chances of someone getting hurt. For example, if your home has a pool, did you remember to secure the gates and drain the pool? Are you liable if a child enters your backyard and gets hurt, or worse? Are you liable if a squatter obtains access to your home and gets injured while inside your property? Can they sue you? These are situations that your bankruptcy attorney may have failed to discuss with you. The good news is you can still do a short sale after bankruptcy. There are basically two ways to remove your name from the deed (title). One is through the short sale process and the other is through foreclosure. A short sale is the better option. There are essentially three reasons to do a short sale. The first is to obtain a deficiency waiver. This is a written agreement from your bank NOT to come after you (sue) for the deficiency amount. The second reason to do a short sale is to minimize damage to your credit. Once the short sale is finalized, banks usually report to the three credit agencies that your account has been "settled or negotiated." This stops the late payments from being reported by your bank. When you do a short sale, your credit may take a temporary hit; however, you can begin rebuilding your credit as soon as the short sale is finalized. This is much better than a foreclosure or Deed in Lieu, where the bank can continue to post late payments to your credit for years and years. The third and final reason why a short sale is the best option is once a short sale is completed, your name will no longer appear on title, and you will no longer face the dangers and costs associated with Zombie title. Many people think loan modifications are better than short sales because modifications give homeowners the ability to remain in their homes. What they don’t understand is that most loan modifications are short-term. Banks might agree to temporarily reduce your mortgage payment; however, the difference (dollar amount) between your old and new payment gets added to the total loan payoff. (Plus interest) At the conclusion of a typical loan modification, not only do you end up owing the bank more than when you started; your monthly payment adjusts back even higher than it was before. Modification is like trying to use a Band-Aid to plug a hole of a sinking ship. It might slow down the water for a while, but the ship will eventually sink. The banks have no legal obligation to modify any aspect of your loan. This decision is completely voluntary. There are government programs which offer incentives for banks to modify, but the lenders still make more money by foreclosing. Additionally, banks can roll "legal fees" into your new modified loan, which were incurred during the modification and trial modification process. This means not only are you paying your previous loan balance, you are also paying legal fees, foreclosure extension fees, late fees, etc. Banks may agree to temporarily modify your monthly payment and interest rate; however, most of them will NOT reduce your overall loan payoff. 30% of people who fall behind on their mortgages catch back up. This means that if the banks wait long enough, they know that you will borrow money from your 401(k), your credit cards, your family, or wherever else you can find it so that you catch back up on your mortgage. This is precisely why banks will not work with you until you are months behind on your house payments, after which, your credit has already been damaged. Almost half of the people who receive loan modifications fall behind again within 6 months. The banks know there is a good chance that any effort it puts forth to modify your loan may result in a failure. This is why banks offer "trial modifications." The trial modification is just another tactic banks use to trick you into paying additional mortgage payments (up to six months’ worth) before they deny your loan modification, or foreclose. Remember if you are offered a loan modification, don't just focus on the monthly payment. Look closely at the terms of the loan. 1) What is the new principal? 2) Does the interest rate change during the life of the loan? 3) When does the interest rate jump back up? 4) What will the payment be at the end of the 3-5 year modification period? Most loan modifications fail for a reason, THEY ARE TERRIBLE LOANS. What is the point of modifying your loan for three to five years and then after the modification period is over, you're in the same position as when you started? The loan payment WILL jump back up, you won't be able to afford it, and home values are NOT going to double in the next five years. You will still have an upside down home where you owe more than it is worth? A modification that doesn't solve the problem, or leaves you living paycheck to paycheck is a BAD DEAL. The goal of a short sale is to offer you a FRESH START. Don't chain yourself to a massive pile of debt by accepting a home loan modification that doesn't help you rebuild your life and your future wealth. Most short sale information on the Internet is worthless. Each state has different laws regarding foreclosure and the short sale process. Most people don’t understand the difference between a short sale vs. a foreclosure in Nevada. Doing a short sale will minimize damage to your credit and enable your family to get a FRESH START. Allowing your home to foreclose will result in maximum devastation to your credit. Additionally, you could get sued by your bank or face a judicial foreclosure. When a home is foreclosed upon in Nevada, the bank has deficiency rights. After a foreclosure, banks issue a 1099-A to both you and the IRS. A 1099-A (abandonment) legally enables the bank to come after you for an expensive deficiency judgment lawsuit. A short sale is MUCH different. After a successful short sale, most banks issue a 1099-C (cancellation) which is a legal cancellation of debt. Banks cannot legally come after you to collect a deficiency once they’ve issued a 1099-C. Banks will do everything in their power to threaten and intimidate, however, once a 1099-C is issued, you are on solid ground. * The above information is not intended as "legal advice;" however, this information is available on the Internal Revenue Service website and is available for all to research. * Many homeowners are unsure what to do and are confused by endless television ads from bankruptcy attorneys trying to convince you that bankruptcy is your only option. Bankruptcy is the worst case scenario. Why go bankrupt if you don't need to? YOU HAVE OPTIONS. 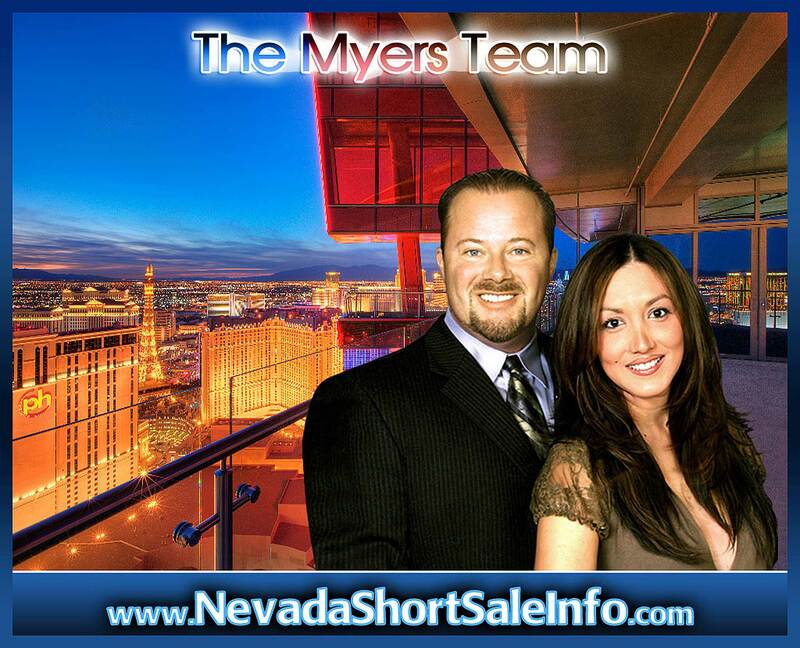 Bill and Francoise Myers run one of the most successful real estate teams in the state of Nevada. They are "Las Vegas Top Real Estate Agents" and have appeared in numerous magazines and publications including the cover of Las Vegas Agent Magazine and the Las Vegas Review Journal. They have been interviewed and quoted for ABC News, CBS Evening News and the Channel 8 I-Team. Since 2002, they have sold thousands of Las Vegas homes. In addition to being successful agents, Bill Myers is an internationally published real estate author. His book: "Clients Are Everywhere - How To Find Them In The Internet Age" is available in twenty-three countries and currently on Amazon's Best Seller List. The Myers Team handles all types of real estate transactions; however, they are best known as "Las Vegas Top Listing Agents," specializing in Seller representation. They sell homes in every price range and condition. No matter the age or condition of your home, The Myers Team has the knowledge and experience to GET IT SOLD. * #1 Status is based on production by non-lawyer affiliated Realtors and Brokers from January 1, 2007 through December 31, 2012. (listing ends only) The information provided is obtained from public records, it is deemed reliable but not guaranteed. The Myers Team does not guarantee that all home owners will be able to purchase a new home in one year or less. This will depend upon many factors, including your credit history before the short sale. Not all clients will qualify for a short sale. Not all clients will be eligible for the advertised services contained in this web site. Not everyone will qualify for Government assistance programs such as HAFA. Banks are not required to participate in the HAFA program. Restrictions apply. Nevada state law (NRS116.4109) requires sellers to provide and pay for a homeowners association resale package. If you live in a home with one or more HOA's, there may be state mandated fees required to comply with Nevada State Law, and homeowners will be required to provide a buyer with all CIC disclosures. The Myers Team are NOT lawyers, nor qualified to give legal advice of any nature. The Myers Team are NOT accountants, CPA's nor qualified to give tax advice. This web site is not intended to offer legal advice and all information contained in this web site is for information purposes only. All Myers Team clients are encouraged to seek the advice of a real estate attorney, and/or a qualified CPA. All of the information contained in this web site is subject to change. All site software, design, text, images, photographs, illustrations, audio clips, video clips, artwork, graphic material, or other copyrightable elements, and the selection and arrangements thereof, and trademarks, service marks and trade names (the "Material") are the property of The Myers Team™ and/or its subsidiaries, affiliates, assigns, licensors or other respective owners and are protected, without limitation, pursuant to U.S. and foreign copyright and trademark laws. The Myers Team™ hereby grants you a personal, non-exclusive, non-assignable and non-transferable license to use and display, for noncommercial and personal use only, one copy of any material and/or software that you may download from this Site, including, without limitation, any files, codes, audio or images incorporated in or generated by the software provided that you maintain all copyright and other notices contained in such Material. You agree not to reproduce, modify, create derivative works from, display, perform, publish, distribute, disseminate, broadcast or circulate any Material to any third party (including, without limitation, the display and distribution of the Material via a third party web site) without the express prior written consent of The Myers Team™. 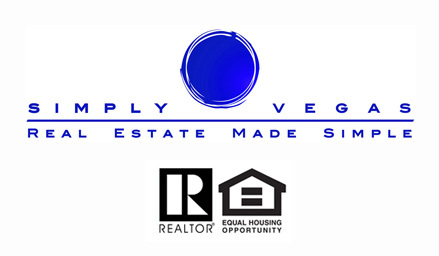 Use of http://www.NevadaShortSaleInfo.com and/or http://www.VegasShortSaleInfo.com and/or http://lasvegaslist4less.com and/or its licensors' Material is only permitted with their express written permission. You further agree that you will not disassemble, decompile, reverse engineer or otherwise modify the Material. Any unauthorized or prohibited use may subject the offender to civil liability and criminal prosecution under applicable federal and state laws.